Trace child's hand onto construction paper. Try different ways like having the fingers all touching together or having the thumb and pinky spread apart more than the others. Cut the handprints out. Use white paper to make circles and ovals for eyes. Make teeth from white paper as well. Attach eyes and teeth with a glue stick and add features some as eye pupils, eyebrows, and mouths with a black Sharpie. 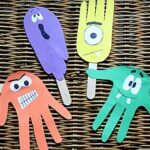 Use white craft glue to attach the jumbo craft sticks to the backs of the handprint puppets. This project for Handprint Puppets for Halloween: Ghoulish fun for kids was printed from CraftsbyAmanda.com - https://craftsbyamanda.com/handprint-puppets-halloween/ and can only be printed for education or personal use.